Staying positive is something that I try to do on a constant basis. It's not always easy to stay positive when life gets hard. Since many people have this problem, I thought that I would share some thoughts. On a personal level, I feel that I am still trying to work on things to help my relationship with Isaac work better. Then our condo flooded, ruining our floors. After that the A/C was broken, and we had a leak in the bathroom ceiling. Now we have problems with the furnace, the dryer caught fire, and plenty of other little things like doors to be fixed. Because we don't have any money, the work falls to us and it is expensive and time consuming. We can only afford to do so much at a time and it takes a long time to finish some projects. It becomes a rather discouraging cycle in addition to our condo being a complete disaster area. And, of course, tensions run high. There is a lot of discontent at home for these reasons. To make it worse (especially for Isaac), I am always up at school and only home on the weekends. And I usually have to cram all my work and friend visitations and time with Isaac into a very short amount of time. Not to mention trying to help out around the condo. I know that this strains Isaac because most of the responsibility lands on his shoulders. As a result, Isaac doesn't often feel very positive about how everything is going at home. Sadly, I feel that way, too. It's hard not to feel defeated about all these bad things and not being able to make it all go away. And even when I am not around, it is difficult. I'm not there to help when something goes wrong (like the dryer catching fire) and the general negativity really begins to wear me down. I do my best to stay positive. I know there is a lot to do and we can't do it all at once, but we are trying to get there. We always have projects to work on (some more fun than others). That our financial situation won't always be so rough. Even though I know things will get better, it gets hard to endure the time in between. Especially because I thrive best when the people around me are positive. So when Isaac is feeling down, it gets hard for me to see someone that I love so much being so unhappy and not being able to do anything about it. That part is probably the most discouraging. Plus, being up at school all the time sometimes makes me lonely. None of my friends and family are up here and I rarely get to see any of them. I actually enjoy being alone most of the time, but on occasion, it does make me a little sad. 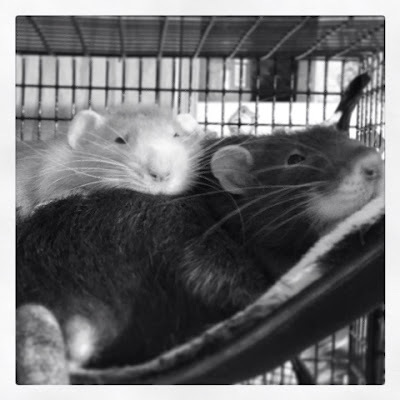 And I really miss my little ratties. How could I not, right? Those cute little faces! And there is one way I stay positive: I look at pictures of my rats and always look forward to playing with them on the weekends. I always look forward to seeing the rats. I try to make some little plans with friends and Isaac. If I get to see some of my family, that's a bonus, but our schedules don't line up all the time. Sometimes I think we have to get away and take a break. That is something that I get plenty of, but I know Isaac doesn't get enough. I try to make sure I spend time with him, preferably away from the condo for a bit. I think that helps both of us. I watch (or listen) to a lot of shows via Netflix. Sometimes I take little breaks from homework to watch a silly video, or go on Tumblr (which always has things to make me laugh), or read a chapter of a book. Sometimes I text my friends or bother them on Facebook. I am lucky enough to have good friends who reach back when I reach out. That always makes me happy. Sometimes I just need a cookie or a cup of coffee to cheer me up. Mostly I stay busy with my program, which is a pretty effective distraction, if nothing else! Halloween, my favorite holiday, was a little sad this year. I spent it by myself in my room doing homework in my costume... That sounds pathetic, yes? I was feeling very down, until I Skyped with Isaac. He talked to me for a long time and brought out the rats. They all cheered me up very nicely. I hope that I have a similar effect on him. I like to feel happy and positive. In all honesty, I usually succeed. Every once in a while, I just need a boost. And I am making it my goal to try to stay positive through all of this, for myself and for Isaac. Isaac, if you are reading this, I love you and I think we can see this through together.